Existing abandoned portions: Space for a station. Touring: F train to 2 Ave. Look at the ceiling and west end mezzanine area at 2 Ave. Existing abandoned portions: Part of a station for 2 tracks and two side platforms. 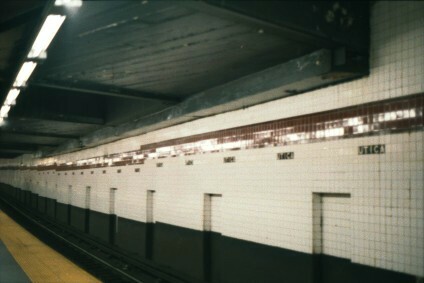 Touring: F train to East Broadway. Look at the ceiling from the open platform, and at the mezzanine area at the north end. Existing abandoned portions: Part of a station for 6 tracks, with four island platforms. Touring: G train to Broadway. Look for traces of stairways up at the north end of the platform and mezzanine. Existing abandoned portions: Part of a station for 4 tracks, with two island platforms. Touring: A C trains to Utica Ave. Look at the ceiling from the open platforms, and at the mezzanines on each side of the shell of the station. The newly constituted Board of Transportation of the City of New York planned a new system of subway routes in 1924, to be operated independently of the existing Dual System that was run by the IRT and BMT companies. It became known as the the Independent Subway on opening of the first portion in 1932, and later as the IND division. A further set of routes known as the Second System was optimistically announced in the fall of 1929, weeks before the stock market crash that was to make further public financing impossible. Within a few years, only federal WPA dollars, the first federal funding of a subway line, permitted completion of parts of the original system. Some small parts of the Second System were actually constructed, namely four places where the routes crossed over routes of the original system. There was to be a station at the four locations, connecting with the station that was constructed and opened. No more than a shell of the Second System station was built at these points, and even then only the portion of the station length that was within the construction limits. The idea was to provide the necessary support columns and allow clearance for the stairs and openings that would be needed when the Second System station was built later. But it never was built. In the station shells, the finished concrete work normally seen on platforms and walls was never put in. There are the steel columns and beams, and unfinished concrete. All of the finish was to be done when the rest of the station was built. 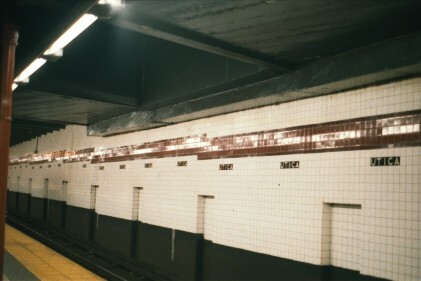 The 2 Ave subway was to cross over an IND line at Houston St, at the west end of 2 Ave station (F train). There is not even a shell here, but just a large open space still visible over the tracks and platforms. No part of the mezzanine intrudes. A 1931 plan shows two tracks with side platforms to be built. A subway from Manhattan to Brooklyn running in East Broadway was to cross over the IND line running in Rutgers St (F train). The crossing is near the north end of the station, and the area is part of the existing mezzanine, near the entrance from East Broadway. The unbuilt line would have been two tracks, and the station would have had side platforms. 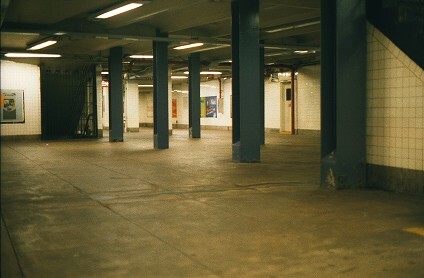 A line of heavy columns marking the center line between the two tracks is visible on the mezzanine, with a clear area to each side where the tracks would have been. At each end of the line of columns is a door. A hole in the door on the west side provides a glimpse to a very short stretch of tunnel, and the floor can be seen to be lower, at what would have been track level. From below, the crossing is easy to spot because of the lower ceiling. The same subway, across the river, was to meet more tracks from Houston St, and enter a massive junction station under South 4 St, Brooklyn, and adjoining private property. Originally planned as 4 tracks, it was replanned as 6 tracks, and that is what was partially constructed. As usual only a shell was built. 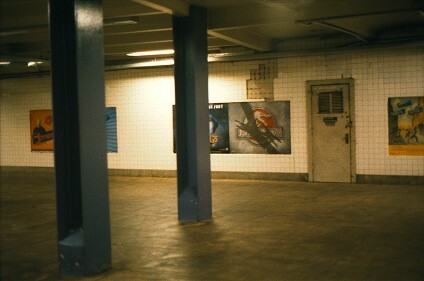 It was to connect to the Broadway station (G train) running under Union Ave. South 4 St is parallel to Broadway, so the station was above the north end of the station. Stairs formerly going up to the unfinished station have been removed, leaving only patched floor and tilework, and the north end of the mezzanine, which was a little large, is no longer publicly accessible. A branch of the same subway was to run south under Stuyvesant Ave into Utica Ave to Flatbush Ave in southern Brooklyn. It was to cross over the Fulton St subway. This station shell is the most obvious of the four, because the mezzanine of the Utica Ave station runs over the top and on both sides of it. There were once even blocked stairways up from platform level to the shell, but they were removed in 1995. Fulton St is not wide enough for an express station, and the northern half of the station is under property acquired for the subway. The unbuilt route also cuts through under the property to get from Stuyvesant Ave to Utica Ave, which do not quite line up. The crossing is not at a right angle. A Board of Transportation map from 1929 shows the never-built Second System routes in thick black, the (eventually) constructed first IND system in alternating black and white, and the older subway and elevated routes in thin lines. Overlaid are notations showing in red the four uncompleted stations, and in green the points where Second System routes diverged off constructed lines (both of the junctions are still there). From Proposed Additional Rapid Transit Lines..., a map made by the Board of Transportation in 1929 and included in full in Twelve Historical New York City Street and Transit Maps, H & M Productions, 1997. The only sign of the crossing at 2 Ave and Houston St is the unusually high ceiling near the 2 Ave end, with heavier and more widely spaced columns. The structure for the 2 Ave subway would fit right through this space. 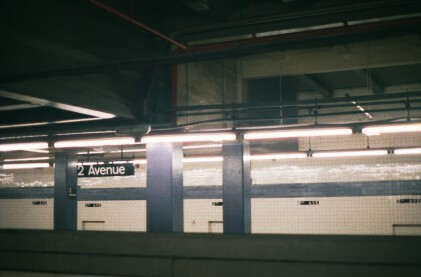 The enormous two-level mezzanine over the station from the 1 Ave end stops halfway instead of continuing to 2 Ave as would be typical in an Independent station. There is just a modest entrance at 2 Ave, possibly intended as temporary. 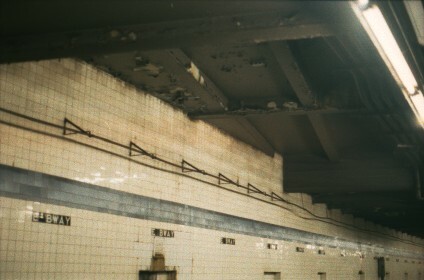 At East Broadway, a different ceiling structure angling across near the uptown end marks where the unbuilt route in East Broadway would have crossed. Believe it or not, this is the constructed portion of the unused station, functioning as part of the mezzanine. Above, the two unbuilt tracks would have run left to right. What would be the Manhattan-bound platform space runs out to the first free standing steel column. 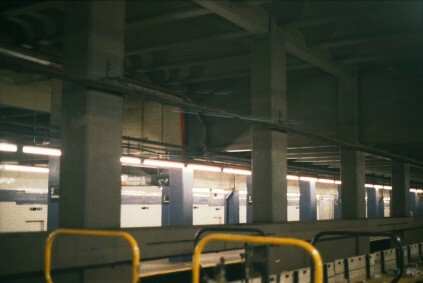 The two tracks would fit between the other steel columns, and then the Brooklyn-bound platform would have access to the gated stairway and tiled column area in the background. Stepping forward and turning to the right gives the next view, below, looking along the intended trackway to a locked door. Behind it, the floor drops to the level of the intended trackways. The space runs for no more than fifteen feet to a solid wall marking the edge of construction. Where the unused upper level at Utica Ave and Fulton St crosses overhead, the shape of the four tracks and two platforms is easily seen. The beautiful station renovation completed in 1996 closed off much of the vast mezzanine. 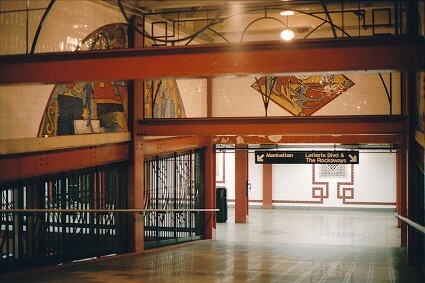 Looking from the west end mezzanine, a ramp goes down to a landing from which stairways lead to the two open platforms. Behind the wall straight ahead, crossing left to right, is the shell of the unused station. The red steel beam at left supports the floor of the closed mezzanine, sloping up to cross over the unused station shell. Access to the unused platforms would be both from the mezzanine over it and by stairways up from the open platforms. ...can all be found on the New York Subway Resources site, http://www.nycsubway.org. Photos of South Fourth St can be seen at Subway and Rail at hopetunnel.org. More Information on these routes, including old plans can be seen at Joe Korman's JoeKorNer web site.